You don't have to be a car expert to pimp out your car, at least I didn't have to be one when I decided to add some sparkle to my beloved Honda Civic. All you have to do is decorate it a bit with Sassy Auto Frames. They have a huge selection of license plate frames that not only sparkle, but come in all different colors! 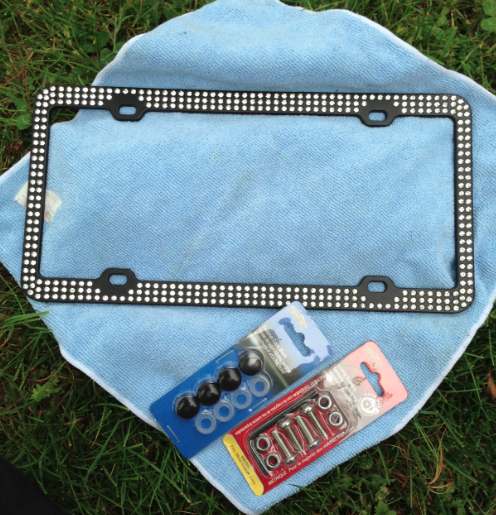 I received a rhinestone Triple Rows Clear bling on black license plate frame from Sassy Auto Frames! I love it! It was SUPER easy to put on especially because it came with hardware. I love how it looks and it's super blingy without overdoing it. It comes with three rows of bling and is made of durable diecast zinc. And no need for me to worry about car washes or the weather, because this will stay together without losing it's little crystals. It fight over my license plate just fine! I have been getting many compliments on my blinged out back end of my car, and I'm so glad I decided to use one of these auto frames! One winner will get a license plate frame of their own! How fun! I like Mega Jet Black! Love your license plates, I hope I win, I could put one on my other car.